In the fifties the Tudor line-up had an alarm watch known as the ‘Advisor’, the only complication available in a Tudor but not a Rolex. This year at Baselworld 2011 the alarm makes a comeback as part of the Heritage collection which takes inspiration from vintage Tudor (last year’s highly successful Monte Carlo was the first Heritage model). 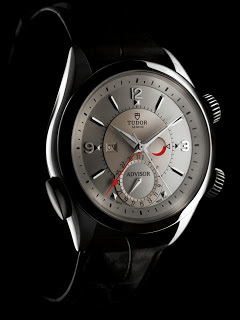 – SJX Addendum: More on the Tudor Heritage Advisor alarm.